Merry Christmas everyone! Today is sure to be the best Christmas of my life, thanks to these two little kiddos. I hope everyone enjoys time with their families because I know I will. Ho ho ho! And... here's our "Christmas card" in case you haven't seen it yet. Enjoy! What the hell is a "morsh" you ask? It's the key ingredient in the cutest Christmas song ever heard. Take a listen and I think you'll agree. Posted by Unknown 0 comments Labels: Anna, audio, K.J. Not really, but my little girl looks so old (and so adorable) in this photo. I'm gonna be in trouble when she really does turn 17. Excuse me while I load my gun. Posted by Unknown 0 comments Labels: Anna, K.J. For the second-straight year Tiff and Pete graciously hosted both sides of our family at their house for a Christmas ripper on Saturday. It is absolutely one of my favorite days of the year, so thanks guys for throwing such a great bash once again. Holiday festivities this year are going to be extra special for us as we now have "little" Leo to experience numerous "firsts" and Anna is at the absolute best age for Christmas. The day was filled with food, laughs and presents, but my favorite part about both sides of our family is that it's always all about the kids. And boy did they steal the show... particularly Leo. He has got to be the best natured baby I've ever been around. Everyone was playing "pass the baby" all day and pretty much every photo of him throughout the day shows him smiling away and enjoying himself... this is so evident in the photo of him and Auntie Carol... one of my favorite photos of all-time. I honestly don't know who's having more fun. Anna got her fix of cousins and uncles on the day too, that's for sure. Like usual, Anna had a blast playing with Kaeleigh and Marisa, but also got some solid time in with Uncle Jim and Uncle Bill. One of the classic moments of the day was watching Anna parade Uncle Jim around the house, holding hands and playing... so cute. And the way she says "Uncle Bill" is simply priceless. Anyway, the holiday season has officially begun for our family and we can't wait for next weekend's festivities in Ludlow and back at Tiff and Pete's again on Christmas day. On a side note: How gorgeous are these two? We capped off a great weekend today by having my parents down for a belated birthday celebration for my mom. It's sad to say, but I hadn't seen my parents in over a month and I was definitely jonesing for a fixin' of Meme and Papa. We celebrated the only way we know how, with good food, good drinks and great company. We supplied the lobster, my parents brought the filets and a full-fledged Cardinal celebration ensued. Papa did his best to tire Anna out... or maybe it was the other way around??? Either way, those two were in their glory playing together, which was perfectly fine with Meme as she got to spend some serious QT with Leo. The best part of today's get together is that it officially marks the start of the holiday season. Today was the first of at least three-straight weekends we get to see my folks. The holidays truly don't get any better for me as work slows down and family time picks up. Happy birthday, Mom! Thank you guys so much for making the trip down to see us! We can't wait to spend the next couple weekends with you guys and the kiddos. Today we were able to continue our family tradition of cutting down our Christmas tree on Papa's birthday. The original Leo Cardinal would have been 95 years old today. This year's tradition had extra meaning for us as it was the first time having a little Leo Cardinal of our own in tow to help carry on the tradition. Obviously Leo didn't have much of an active role in the process this year, but it was definitely a special occasion and his namesake would have been proud. Anna, however, was VERY active in the whole process. She helped pick out the tree, helped cut it down and provided entertainment along the way. We told her she could pick out whatever tree she wanted. At first she liked this idea, but then she was a little bummed when we informed her that she couldn't get this little sapling that she seemed to love. In the end, Anna helped pick from the handful of full-size trees that we chose. It was a good compromise, but in hind sight, I kind of wish we would've gone with the sapling just because she was so cute posing with it. At the end of the day, I noticed something that caught me off guard a little and left me a little teary-eyed. Behind where we parked, there was a shed housing an old Ford tractor. Sure it wasn't the right color or the same model as Papa's old, red tractor, but the fact that a 50-plus-year-old Ford tractor was sitting there staring at me on this day brought back a lot of memories. When I asked the elderly man that owned and operated the tree farm about the tractor, he was quite proud of his old machine that he's owned "forever" and still uses to this day to plow snow. Talk about the most fitting way to end our annual tree cutting tradition. Little Leo was with us in body, but the original Leo Cardinal was also clearly with us in spirit. We miss you, Papa. Well, Christmas season is officially upon us and Anna has become addicted to Elf the movie. She definitely takes after her dad and Aunt Kate as she is quoting the movie already. Take a listen to these two little nuggets I captured: Buddy the elf | Cotton-headed. I can't wait for Christmas this year, Anna is at the perfect age. And, work should slow down enough so I can catch my breath and actually update everyone on my cute kiddos. Stay tuned. I know Halloween was almost two weeks ago, but I still had to get this post up. Well, the loyal followers of The Cardinal Blog had their voices heard as Leo donned his Candy Corn costume for his first Halloween, much to the dismay of his father. Spiderman made a valiant late run in the online poll, but Candy Corn edged him out 33-31... Rudolph garnered a measly seven votes. Thanks to everyone who voted. While this was Leo's first Halloween, the holiday ended up being all about Anna. She experienced Halloween festivities at Intel, downtown Hudson, daycare and of course Gerry Drive on Halloween night. At Curious Kids, all the kiddos strutted their stuff in their Halloween costumes with Anna being "Tinkerbell." I finally got to snap a pic of Anna with her buddy Noah (AKA Woody), so it was a momentous occasion. After the gathering at day care, we headed downtown for trick-or-treating at the local businesses in Hudson. With very long lines at every stop, Anna was able to eat the piece of candy she just received before we were even able to get to the next store. Thankfully she was tired and didn't mind us heading home a little sooner than anticipated. Halloween night was once again a blast. As was the case two years ago, the highlight of the night for me came prior to trick-or-treating when we handed out candy at our house. Every time the trick-or-treaters would ring the doorbell, no matter where Anna was in the house, she'd scream and come running to see the kids. This year I let Anna hand out the candy too, which was pretty comical. I would hold a big basket up for her and she would reach in and dish it out to the kids. Some kids would get one or two pieces, while someone would get seven or eight. There didn't seem to be a rhyme or reason, but I'm sure our "generosity" got mixed results from trick-or-treaters throughout town. We had over 100 trick-or-treaters, which was awesome. We nearly ran out of candy and toward the end of the night, Anna was getting somewhat stingy with the candy and wouldn't even consider giving any kids the remaining few boxes of Nerds, as those were definitely her favorite candy of Halloween 2010. All-in-all it was a very successful holiday. It took Anna a few days to come down from her sugar high, but there is still some Halloween candy in the house, which is always a parent's best friend as a bargaining chip. Cardinal Vault XXI: You want some? Last night I was doing some work and somehow stumbled upon this old clip of Anna that I just had to post. So, the 21st installment of The Cardinal Vault brings us all the way back to September 23, 2009. Well, it's obvious that Pack Network is flourishing these days as KJ doesn't have as much time as he'd like to update the blog with posts of our adorable little Leo. So, I've decided to step up and help remedy the situation by trying my hand in this blogging business. Here's an update from me, Angie, on my little mama's boy. Physically, Leo is still off the charts. He had his check up this morning and now weighs 21 lbs 14 oz and is 27 inches long. When it comes to Leo's behavior, he's a role model for all babies out there. He's sleeping through the night now (Yay!) and has put himself on a consistent napping regiment throughout the day. As you can imagine, Leo is a champion eater. I'll take some video of him eating his cereal and post it soon. It could be a little foreshadowing of his competitive eating career. I return to work this coming Monday, so Leo will start day care next week. We made a visit last week so he could meet his "teachers" and new "friends" in the Infant room at Curious Kids. This is the same day care where Anna goes to preschool which makes my return to work a little bit easier this time around since we know and trust the teachers and staff. During Leo's 9 + 1/2 month gestation, both Meme and Vo Nezzy (aka Darlene and Ines) have told me there's nothing like a mother's love for her son. I didn't doubt them one bit, but I couldn't have fully understood their words until I experienced the way Leo looks at me. I don't know how to describe it but he does in fact have a way of connecting with me a little differently than either Sammy or Anna did. I am truly blessed! There used to be a time in my life when I'd be so bummed if I wasn't in the building for a big game like tonight's Celtic home opener against the Heat. But Opening Night festivities at our house tonight couldn't be matched anywhere. During the preseason this year, I busted out some of my Celtics paraphernalia (rally towels, thunder sticks and wrist bands) and Anna really took to it. I used it as my way of getting her into the games and it has worked like a charm. Sure we spend most of the first quarter bopping each other in the head with the thunder sticks, but she'll get into the game a little bit with her patented "yessssss!" when the Celtics score. And, she'll dip into her bag of tricks and do an occasional "whoooo!" and wave her rally towel. It's pretty fun... until she gets sick of it, right around halftime and is ready to move on to something else. Anyway, Leo threw on his Pierce jersey/onesie (thanks Adam & Holly!) and fit right in. He is pretty amused by anything Anna does, so thunder sticks and rally towels really grabbed his attention. I am already looking forward to the day when I can take both of them to a Celtics game. Some of my favorite memories with my Dad have come watching the Celtics both in person and on TV, when I was a kid and an adult. So in my mind, they can't be too young to get addicted to the Celtics. It's in there blood, so they really don't have a choice in the matter. GO C's! I can't get enough of that audio clip of Anna I posted yesterday. I have probably listened it to 100 times and can't help but laugh each time. So, I've decided to try to make the audio clips a regular occurrence. When asked what she's going to be for Halloween, listen to what Anna said. Posted by Unknown 2 comments Labels: Anna, audio, K.J. Anna LOVES chocolate. Just listen to what she has to say about it. 2010 Halloween polls are open! The past three years, The Cardinal Blog has featured a voting poll so followers could determine which adorable Halloween costume Anna sported on Halloween. Last year your voices were heard as Anna was monkey-ing around Hudson. In 2008, she had a yabba dabba doo time as Pebbles Flintstone, while in 2007, a three-week-old Anna rocked a chili pepper costume at the request of the Cardinal Blog majority. This year Anna has decided to be Tinkerbell, thus shunning the vote of the populous, and has her costume waiting in the wings. So naturally, Leo "willingly" becomes the subject of our 2010 Halloween poll to keep the tradition alive! Sammy helped get these photos together so you can make an informed decision in exercising your Cardinal Blog follower's right to vote. The poll, which is posted in the column on the right, will close at 5 p.m. on Thursday, October 28, so be sure to get your votes in soon! Note: You facebookers out there, log on to TheCardinalBlog.com to cast your vote today! 26,280 hours. That's how long we've been fortunate enough to have Anna in our lives. Our baby girl turns three today. The last three years have been the craziest, most hectic time in my life and I wouldn't change a thing. Watching Anna grow and being able to have a direct influence on her every move (good and bad) has been such a challenging and rewarding privilege. She is turning into quite the little girl who always keeps us on our toes and that's probably what I love the most about her. You never know what she's going to do or say and she's a ball of energy and passion. Her "passion" can sometimes come through in feisty ways, but when it comes to that, the good outweighs the bad by a long shot. I've always lived my life passionately and the fact that at three years old Anna is passionate really makes me proud. She is funny and playful. She is tough and determined. She is independent and carefree. She is loving and caring. She is smart and beautiful. She is a good sister and a fun cousin. She is so much more than I ever thought my daughter would be and I can't believe that she's already three years old. I really wish I could bottle her up at this age and just never have her grow older. Obviously that can't happen, but it just shows how much I love my little three-year-old. Happy Birthday Anna! We love you more than you will ever know. Posted by Unknown 1 comments Labels: Anna, Birthday, K.J. My obsession with my newest toy spread to New Hampshire this weekend as we went up to visit my family. After seeing the footage from my ride with Anna, my Dad seemed to be into the idea of hooking the camera on his motorcycle, so that's exactly what we did. Such a cool perspective. TIP: If the HD video is loading too slowly for you, click the up arrow in the bottom right corner of the video player next to the number (720p) and select small size (360p, 480p). Or, get a better internet connection. Anna benefited from a little Pack Network R&D this morning as I brought her to daycare in her little chariot. For work, we recently purchased this tiny little HD camera that you can pretty much mount anywhere. The dimensions on the camera are 1.6” x 2.4” x 1.2”, so it really is tiny. And, it shoots standard and wide-angle 1080p HD video. It's legit. In just two days, this camera has already turned into my favorite toy and will be sure to provide some unique perspectives on anything and everything I can think of. Enjoy the show! Well, well, well. Leo had his 10 week check-up today and the "little" guy is OFF THE CHARTS. The doctor said that his percentiles for height and weight are so high that they are literally off the chart... meaning he's above the 99th percentile in both categories. Leo is already up to 25 inches long and... wait for it... 17 pounds, 2 ounces. Good lord. As a point of reference, at 18 weeks Anna weighed 15 pounds, 1.5 ounces (80th percentile). And, at nine months, she weight 20 pounds, 3 ounces (75th percentile). This kids' gonna be a beast. I'm expecting a phone call from ABC any day now to start shooting the pilot for a new reality series called "Leo vs."
For some reason Leo loves the feel of my goatee so much that it makes him giggle. Come one, come all and read the story of the YEAR!!! 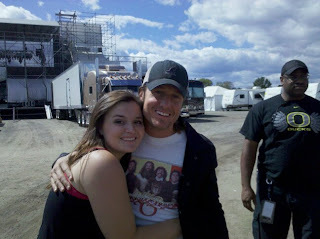 For those of you who DIDN'T get a hysterical phone call from me on Saturday - I GOT TO MEET KEITH URBAN! It was literally the best moment in my entire life...so much that I still find myself pinching my skin every now and then to make sure it wasn't just a dream. For the FULL story, please visit MY blog at keithaholic.com. Anna has a hat, whaddaya think of that. Nearly the entire time while we were on our road trip odyssey, Anna provided the entertainment. Singing was more often than not her method of amusement and Take Me Out To The Ballgame was probably sung a few hundred times... and it never got old. Take a listen and I think you'll agree. The insanity that is our lives these days yielded Leo's first road trip last week and without a doubt he proved to be an unbelievably portable baby. Over the course of six days, we traveled over 1400 miles, visited four states and stayed in four different hotels... and the little guy didn't miss a beat the entire time. We left Hudson on Friday morning for Rochester, N.Y. A friend of mine, Jeremy Friel, was getting married on Saturday and I was the wedding videographer. Having to stop every three hours or so to feed Leo, we ended up being rather pressed for time for me to make the rehearsal. Thankfully we made it with a few minutes to spare. The rehearsal was straight forward and didn't take too long, and then we were off to find a little local flavor for dinner. We ended up stumbling across this cool spot right on Lake Ontario, The Pelican's Nest. Anna was in such an awesome mood that she really stole the show at the entire restaurant. At 9 p.m. a local cover band was set to play, so near the end of dinner they started their sound check. Anna was so into it. All she wanted to do was cover her ears with both hands and stand there and stare at the band. It reminded me of how she is with fireworks... you're not sure if she likes it, but then once they'd stop, she'd beg for more. It was hilarious. Saturday was pretty much all about the wedding for me, while Angie took the kiddos to the pool at our second hotel of the trip. The wedding was great and it was fun to get to spend time with the entire Friel clan... New Hampshire's finest. On Sunday morning, we woke up and had breakfast in the hotel with the other wedding guests. After a great breakfast, we hit the road without a plan. Those of you who know Angie and I, know that we often have the most fun when we don't have a plan... kind of like on our honeymoon when we ended up staying a night in the guest bedroom at a winemaker's house in the middle of his family vineyard in Sonoma... but I digress. Well, this wasn't quite that good, but it was still a blast. First up, we were cruising on the highway, about to blow through Buffalo, N.Y., when I said, to Angie, "Google 'the birthplace of buffalo wings' and see what restaurant comes up." Sure enough, the first result was the Anchor Bar... so off we went. This place was a combination of dive bar and hole in the wall... definitely right up our alley. We obviously ordered wings, which were very good... nothing earth-shattering about the wings, but tasty. After lunch, it was back on the road again, with our destination this time being Erie, Pa. While we were at lunch, I was searching for things to do in the area and found out that the Erie County (N.Y.) Fair was ending that night. So, Angie threw Leo in her little baby sling, we woke Anna up from her nap and put her in the stroller and off to the fair we went. Angie was once again a super good girl and was all excited to try out some of the awesome fair rides. We quickly realized that Anna is probably at the worst age for these fair rides... too short for the rides she wants to go on and too big for the baby rides. Once she laid her eyes on the Super Slide though, that's what she wanted to do. Luckily for us, the attendant of the ride didn't bother checking Anna's height, so we snuck in and up the stairs we went. Anna was a jabberjaws the whole way up the stairs and was visible ecstatic to go down the slide. We sat next to each other and down we went. We were about half way down, when Anna's momentum got the best of her and she banged her head on the slide pretty hard... Angie got this picture which is actually kind of funny (knowing that Anna is OK) because this is the exact moment when she fell back and smacked her head. I knew that Anna was more scared than hurt, but she was actually pretty shooken up by the whole incident. So, I diverted her attention by pointing out the huge bouncy house obstacle course ride they had. This seemed like a good idea, but nearly turned into a huge disaster for her. To make a long story short, she couldn't make it through the obstacle course, so the ride attendant (donning a sick mullet) helped her out of the bouncy house just a minute into going through the five minute course. Anna didn't realize that she missed out on nearly the entire ride and was eager to get in line for another ride, when over her shoulder, I saw the bouncy house attendant hollering for help because the bouncy house lost its air and was collapsing down on kids. Thank God Anna got off that ride before that happened because she definitely would've been trapped in there. And, while she probably wouldn't have been hurt, she may have been scarred for life by fair rides after her Super Slide incident too. Anyway, we capped our day at the fair by checking out the Stunt Dogs show. This was BY FAR Anna's favorite thing of the day... I know, shocking it was better than the near concussion or entrapment of the fair rides. But, this was actually really cool. We left the fair around 10 p.m. and headed to Erie. The second half of the trip wasn't nearly as good as the first half. In a word, Erie, Pennsylvania is depressing. We checked out Presque Isle State Park, which had potential, but it was rainy and windy, so we couldn't take advantage of the dozen or so beaches and ponds. We drove around for two hours trying to find a good spot to eat and ended up settling on a chain restaurant across the street from our hotel. Pretty sad. On Tuesday, we got up and headed to Moon Township, Pa. for a training session I had scheduled at Robert Morris University. We were able to squeeze in a lunch at this cool cafe in Sewickley and hit up an old-school candy store for Anna. We capped off the trip by driving til about midnight and crashing at a hotel just outside of Scranton. As you can see, there was a lot going on and the trip was a blast. Angie proved once again why I married her as she was such a trooper with the kids while I had to work and agreeing to the crazy road trip in the first place. I wasn't looking forward to being away from my family for six days straight, so we turned that potential negative into a huge positive and had a blast. I can't believe that the new athletic season is here already. The summer went by like a blur, but at least we got to cap it off with a solid road trip. I know this blog was set up to talk about the adorable little kiddos of the Cardinal family, but I just had to post because I'm SO EXCITED for Sunday. No folks, I'm not spending the day with Keith Urban, but with the amazing, beautiful, intelligent.....TIFFANY GEORGE! On Sunday I got a call from Tiffany asking if I was doing anything this coming Sunday. Fortunately, Sunday is my day off from ALL jobs, so Tiffany and I are spending a day together...AT FOXWOODS! You may ask yourself, could this get any better?!?! YES...We are going to CIRQUE DREAMS JUNGLE FANTASY!!! The plan is to leave New Hampshire at some point on Sunday morning, travel down to the Foxwoods area where we will check into our hotel and take the shuttle to Foxwoods to *hopefully* win some mula and drink our faces off (...well, I will at least). At 7pm we will attend the awesome new Cirque show (that I've been wanting to see for years) and have a wonderful night with just the two of us. I know to a lot of people this seems like just a fun little trip for two sisters, but really it's so much more. Obviously I love my nieces and nephews SO much, but it's always so much fun to just spend time with your sibling. I'm so excited and so grateful that Tiffany asked me to join her on this awesome adventure. I can't wait! LOVE YOU SISTER! It's hard to believe, but three years ago today, The Cardinal Blog was born. What started off as a way of keeping my mother up-to-date on all things related to her soon-to-be granddaughter has really evolved into one of the greatest creations of my life... second only to my children, of course... which without whom would make this blog rather boring. Over the course of three years, I've blogged about pretty much everything from being a work-at-home dad to watching my favorite team capture an NBA title. And, it continually amazes me how many people are paying attention. Not a week goes by when I don't run into someone that is mentioning the blog. When I decided to do a running diary of Angie's induction day for the birth of Leo, the blog had nearly 1,000 hits for the big event. I'm not sure if I should be flattered or frightened. Either way, the blog is clearly here to stay. And, even though my posts are more sporadic these days with an increased work-load, I'm proud that I've managed to get up nearly 400 posts over three years. The two motivating factors that drive me to do the blog are my mom and my children. My mother is so appreciative of the time I put in, that it makes it all worth it. And, my kids someday will look back at the blog and think one of two things... "I'm so lucky my dad stuck with this blog to chronicle my life" or, "Wow, my dad's a total nerd." A combination of the two is probably most likely. Anyway, thanks for reading and continue to enjoy the show. Posted by Unknown 2 comments Labels: K.J. Just over six weeks old and Leo's primed to be the next Pack Network employee... thanks to this awesome onesie that Norm got the little guy. One thing I can promise, he's going to be an awfully cute nerd... Leo... not Norm. Yesterday Leo got to meet one of my all-time favorite families... the Lords. Bill, Kathy, Ethan and Kaeleigh were in the area for a hockey equipment sale and we parlayed that into a day of hanging out at our house. We had a blast as it was really a love-fest all around. It was so great to hang out with Bill and to get to see him with Leo. The males in our family all have a great way with kids where they gravitate to kids and vice versa... so we were all in our glory. Not only did Leo and Bill get some good time together, but by the end of the night, Anna was sitting on Bill's lap and gave him a big kiss when they left. No disrespect to Bill though, but he wasn't Anna's favorite on the day... that title, without question, goes to Kaeleigh. Anna shadowed Kaeleigh all day and the two became fast friends. Most girls Kaeleigh's age would probably be annoyed by having such a relentless shadow, but not Kaeleigh... she seemed to love it. Anyway, Angie and I had such a great time too. Those of you who know them can attest that Bill and Kathy are two of the easiest going, fun people to hang out with. With a collective six kids between our families, life is so busy, but we are hopeful that we can make a conscious effort to hang out more often... with the love-fest that goes on, it just seems like the right thing to do. Thanks so much for coming down, guys. Hopefully we'll see you all (and Sam) soon! Despite being only 40 days old, we took Leo to his first ever baseball game tonight as the Worcester Tornadoes hosted the New Jersey Jackals. Our swaddled little bundle of joy was as perfect as could be. For most of the night, Angie had him cocooned to her body in this Moby contraption and he was as snug as a bug in a rug. Seriously, he loves that thing. But then again, what man wouldn't love one of those things... being pressed against a woman's chest with nowhere to go... but I digress. He will obviously have no recollection of the game, but it's just already evident that with our second child we are letting our guard down a little. I mean, we didn't take Anna to her first baseball game until last year, when she was just over a year-and-a-half. Speaking of which, Anna absolutely LOVED the entire night. She actually paid attention to the game for the first few innings, which was rather shocking. After that, it was all about the Tornadoes' mascot, Twister. We bought her this little Twister doll right when we got to the park and her infatuation began. Once she saw the real mascot on the field prior to the game, she had to know where he was at all times. What was comical though, was when I took her to go up to him to say "hi". She wanted absolutely NOTHING to do with him. She was clinging to my leg (which NEVER happens) and said, "Daddy, hold me." Even with me holding her, she didn't want to say "hi", give him a high five or nothing. I guess she prefers to stalk mascots, not have a real relationship with them. Well, after the game, they had their Friday fireworks and it was once again a great showing. Like always, Anna plugged her ears and huddled against my chest as if she didn't like them. Then, once they were over, she couldn't stop talking about them. Right before the fireworks started, I took this picture of Anna where she seriously looks about 20 years old. Such a cutie. Probably my favorite part of the night though came after the fireworks, when Anna lifted her head off my chest, sat up straight and said, "Thanks for taking me to the ballgame, Daddy." As if the kid doesn't have me wrapped around her little finger already. Anyway, I swear minor league baseball is one of the greatest family-friendly events that you can do... and it's rather affordable. Anna has already asked to go to another game, so we might make this a more regular occurrence. Who knows. Well, the blog was on fire for a while there and then reality had to rear its ugly head as I've had work to do lately. Anyway, I just had to post this photo of these little buddies. Anna isn't infatuated with Leo 100% of the time, but when she is it's so ridiculous. Again, I know it's jinxing it, but he doesn't seem to fuss like normal babies. Anna was a good baby, but she'd have her moments when she'd fuss for what seemed like no apparent reason. But not Leo. One of those three things always seems to satisfy him. Well, Saturday we head off for the annual Cardinal family vacation, so be prepared for some ridiculous posts with all the kiddos together. Here at the Cardinal Blog we are about more than just cute kids and a dorky Dad. We are here to instill in everyone some of life's most important lessons, just as my parents instilled in me. I feel Angie and I have a rather unique parenting style though, which has yielded a two-and-a-half-year-old daughter that is well behaved 91% of the time and a raging lunatic 9% of the time. So, while our "teaching methods" may not fit your parenting style, the important thing to take away from this running series of "Life Lessons" is really the message moreso than the actions. With that, let's jump right into Life Lesson #1: Recycle. From a young age, I can remember my grandfather taking recycling to the Nth degree. Not only would he make a small fortune off recycling his empty Milwaukee's Best cans, but he'd rummage through public trash cans in search of these precious aluminum treasures. Some people may think, "Gross" or "what was your grandfather, a bum?". While the former may be the true, the latter definitely is not. Papa would take the money from his recycling and set it aside earmarked as lobster money. That's right, Papa would root through public trash cans to get a taste of that sweet tomalley. He'd save the money so whenever we'd want lobster growing up, that he'd go into the small fortune accumulated through recycling to get us a batch of those beautiful 10-legged creatures. Talk about recycling for all the right reasons. I mean, sure it's great to save the planet and all that tree-hugging mumbo-jumbo, but the ends have never more justified the means when it comes to recycling. So, I've decided that I'm going to carry the life lesson of recycling on to my children, but put my own spin on it. Basically, I thought Anna would get a kick out of the recycling machines in the redemption center at the local package store I single-handedly keep afloat. So, we loaded two empty cases of Corona into the Xterra and off we headed to "beer store", as she calls it. Just as I expected, she loved sliding the bottles into the redemption machine. Sure she felt it was "really loud", but once she learned that the machine would give her a ticket and that the man at the counter would give her money for said ticket, then she was hooked. Leo continues to be a remarkable baby in all facets, but he's probably an even better toy for Anna. She seems to be fascinated with him and everything he does. Her biggest fascination has to be his poop. Everytime we change his diaper, she wants to see. She inspects his bum and has to know what color his poop is. It's pretty comical. Anna has also got some solid seat time feeding Leo. Today she was all fired up to give Leo his bottle, so I set her up with the "boppy" and let her have at it. She's so gentle with him, that I really don't have any concerns. Of course I sit there ready to pounce if she does something she shouldn't, but she is so gentle that I'm not nervous at all. At that feeding, Leo was polishing off a half-full bottle to start with. So mid-feeding, Anna handed me the empty bottle so I could switch it out for the new one. Anna had sacrificed up her own thumb to use as Leo's pacifier. It was so cute. She was so proud of herself and said, "Daddy, he's sucking my thumb!" Such a great moment. Leo, buddy, you don't know how good you have it. From day one you've had Sammy, one of the best big sisters of all-time, eating out of your hand and now it looks like Anna is headed that direction too. You're a lucky guy.